This Chilean literary thriller tells the story of three lives intertwined with that of an enigmatic author, whose character is inspired by the groundbreaking Brazilian writer Clarice Lispector. Vera Sigall, now eighty years old, has lived a mysterious, ascetic life far from the limelight of literary circles. 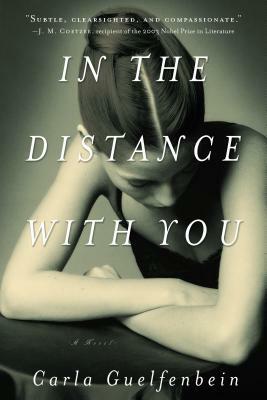 This powerful character has a profound effect on those around her—Daniel, an architect and her neighbor and friend, unhappy in his marriage and career; Emilia, a Franco-Chilean student who travels to Santiago to write a thesis on the elusive Vera; and Horacio, an acclaimed poet with whom Vera had a tumultuous, passionate affair in her youth. As Daniel, Emilia, and Horacio tell their stories, they reconstruct Vera’s past, and search for their own identities. Spanning from modern-day Chile to the 1950s, 60s, and through the years of the Pinochet dictatorship, With You at a Distance reveals successive mysteries anddiscoveries like a set of Russian nesting dolls. Carla Guelfenbein studied biology at Essex University. She also studied graphic design at St. Martin's School of Art in London. Back in Chile she worked as Art director in BBDO, and fashion editor at ELLE. She is the author of the novels El revés del alma, La mujer de mi vida, El resto es silencio, Nadar desnudas, Contigo en la distancia, and a number of short stories which have appeared in important magazines and anthologies. Her work has been translated into 14 languages by the most prestigious editorial houses in Europe. Contigo en la distancia won the important Alfaguara prize, and was simultaneously launched in Spain and Latin America. John Cullen is the translator of many books from Spanish, French, German, and Italian, including Philippe Claudel's Brodeck, Juli Zeh's Decompression, Chantal Thomas's The Exchange of Princesses, and Kamel Daoud's The Meursault Investigation. He lives in upstate New York.